I'm cutting all of the pieces for the pineapple log cabins from my batik scrap box. I'm almost out of die cut pieces so it will be back to pressing and cutting today. I have made all dark blocks so far (dark centers and outside corners). I will probably make 2 light blocks now and alternate with dark ones to see if that is the way I want to go. I really like it as all dark blocks already. I will need to cut some light fabrics from yardage because the scrap box is mostly medium and dark fabrics. I will choose all of the light batiks that I don't like as well and that never seem to get used. All they need to be is light value that is a contrast with dark values and the design in the fabric isn't important in a 1.5" wide piece. 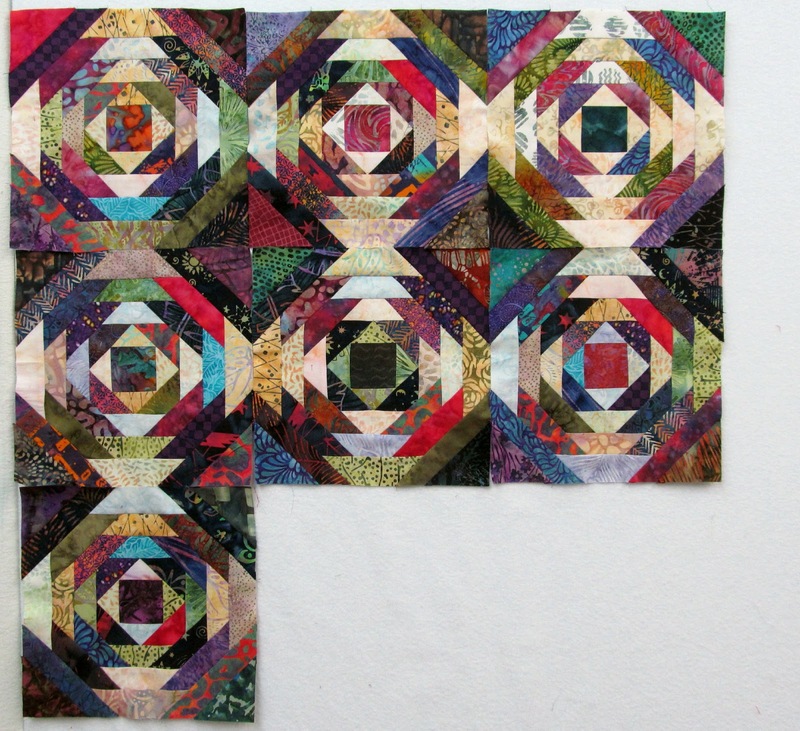 When you are cutting these from scraps do you make fabric strips and then just cut what you can? I have been puzzled with this one and the log cabin one, how you would make it if you didn’t want it scrappy. Thanks for your posts. I enjoy your colour sense and your flowers. Wanda, this is fabulous. I'm not sure you even need the light ones as this is so striking already. I take it the new die was worth it to get this much done already. They are jewel-like. Do you put cut strips on your die or large pieces that cover the die? I am not sure how scraps could best be cut. LOVE these! A pineapple log cabin is on my "some day" list. By now you have already cut those lighter blocks to add to your pineapple log cabin and have decided if they will compliment your design. SOooo ~ I'm anxiously waiting to see what you decide. Looking good! I like it as all dark blocks, really striking. Those are absolutely gorgeous. I'll be interested in seeing what light blocks do to it as I love the look of the dark. I love this, I think you've inspired me to make another pineapple quilt.